The suburban areas of Boston rely primarily on technology manufacturing and national defense. The outlying areas of Boston are populated with a wide variety of skilled technical workers and military bases. Two of the key economic drivers for the city of Boston are tourism and medical research. Boston ranks 10th among United States cities for domestic and international tourism. This helps to drive the hospitality and food service industries. The increase in medical research in the United States is also driving the Boston economy. The presence of significant medical colleges and universities in the Boston area have helped to shine a bright spotlight on Boston’s medical research sector. This is a part of the economy that continues to grow and continues to bring in more financial opportunities. The office rental business in Boston has been booming since 2008. One of the interesting statistics to note when it comes to Boston office space is the 150 percent increase in rental rates over the past six years. In 2013, the vacancy rate for Boston office space was only 12.4 percent. That number is a drop from the 14.5 percent vacancy rate that Boston experienced in 2012. Nearly 80 percent of all Boston office space is located in the areas of Back Bay, the Financial District and Seaport submarkets. In Boston, the least expensive office spaces are Class B spaces that rent from $25 to $45 per square foot, the majority of which are located within the Seaport districts of Boston. The Class A High Rise office spaces in Boston carry the most expensive rental price tag at $55 to $75 per square foot. The Back Bay area is home to some of these high rise areas, where the vacancy rate in the Back Bay area is only 8.9 percent. Other Class A High Rise properties are located in the Financial District, with the Financial District carrying a higher vacancy rate of 15.3 percent for its Class A properties. 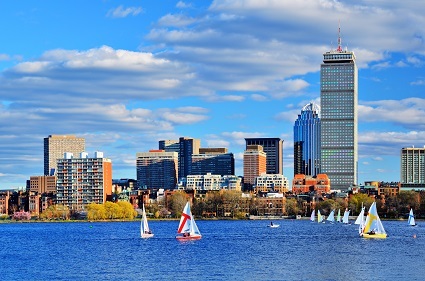 For further information on office space availability in Boston click here. This entry was posted on Thursday, February 12th, 2015 at 11:13 am	and is filed under Boston, Business Advice, Business Spotlights. You can follow any responses to this entry through the RSS 2.0 feed. You can leave a response, or trackback from your own site.